Last month, Degy Entertainment unveiled a rather intriguing breakdown of what it actually costs to book some of your favorite bands, from Morrissey to Dave Matthews, We Are Scientists to, um, Jimmy’s Chicken Shack. As it turns out, though, their data wasn’t exactly the most up to date. As Business Insider points out, they didn’t “verify the veracity or timeliness of the list,” and thus the list wasn’t nearly as comprehensive as it could have been. 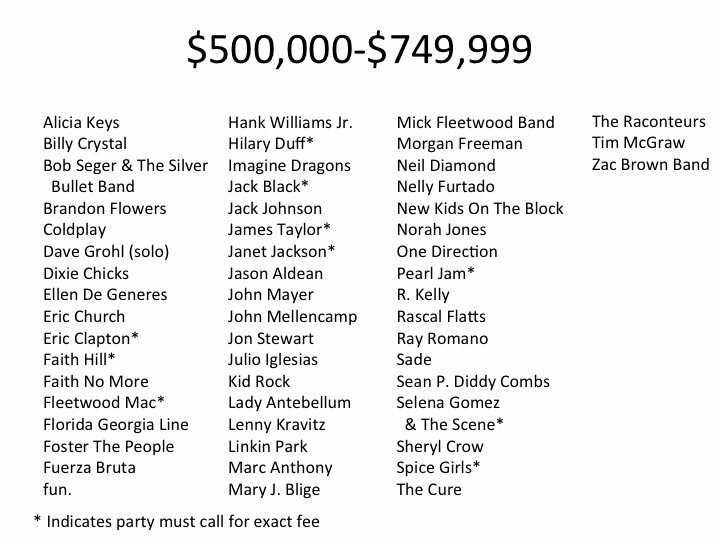 The biggest names in music, like Sting, Rihanna, Elton John, Paul McCartney, Taylor Swift, and Justin Timberlake, will always ask for over $750,000+ for a US event and even more for an international event. These acts very often turn down offers from buyers they do not know, but CTI, an experienced major name talent buyer, can help you get a name confirmed if a buyer has the budget to hire the act. Speakers like Arnold Schwarzenegger, Bill Clinton, Tony Blair, and Richard Branson have a speaking fee of over $200,000, and a private jet also needs to be provided or paid for by the client. 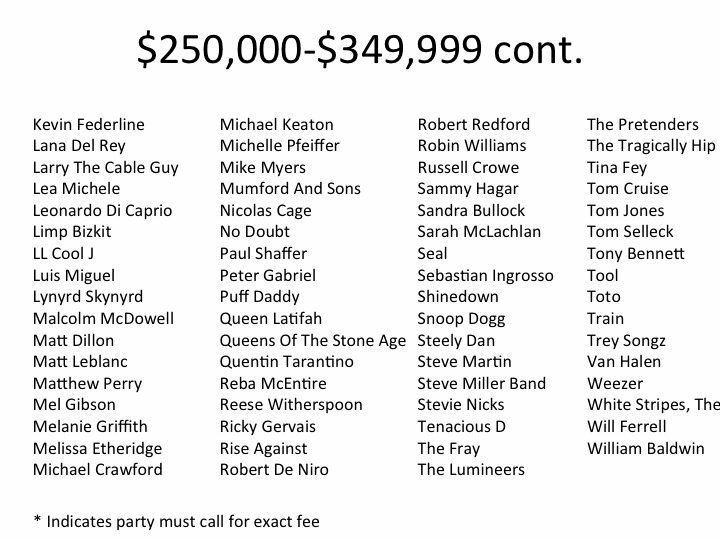 – You can snag legends like Bob Dylan and Patti Smith for $250,000 each. Forget a mortgage! – It would cost you $750,000 to secure The Eagles, but only a total of $550,000 for Don Henley, Joe Walsh, and Glenn Frey. Seems like a steal to me. – Want Prince at your next pajama-themed pool party? It’ll run you a hefty $2 million. That’s enough for some 40,000 boxes of Dunkaroos. 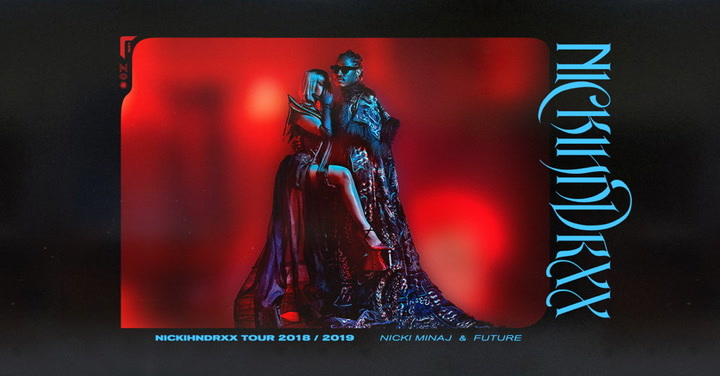 – For the low, low price of $8 million ($1-$1.5 million each), you could throw the best music festival in history with Arcade Fire, Jay Z, The Rolling Stones, Elton John, and Bruno Mars. 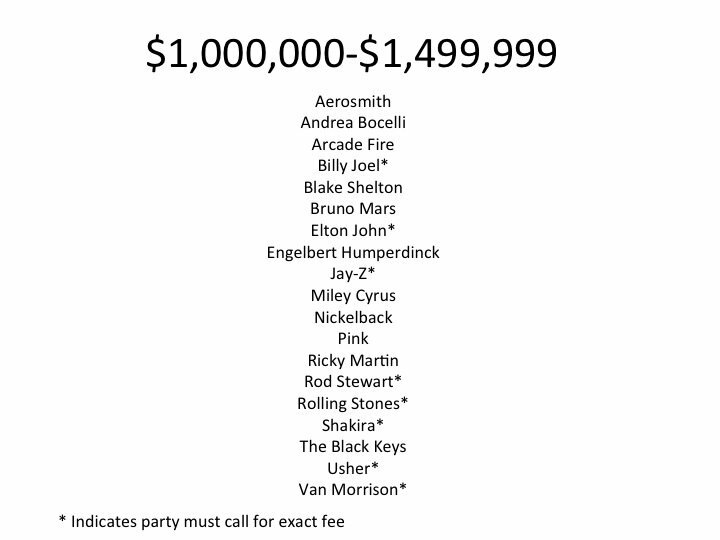 – If you have just $750,000-$999,999, you can get book either Eminem, Sting, Neil Young, Muse, Adele, or Tom Petty and the Heartbreakers. 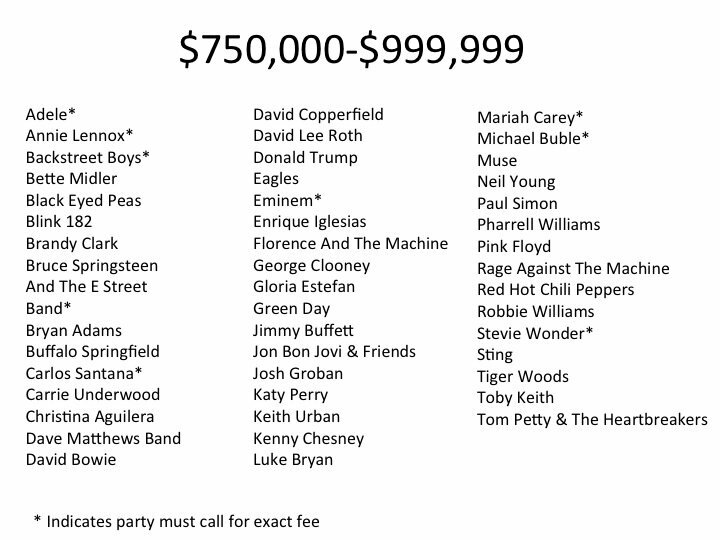 – If I had just $700,000, I could finally achieve my dream of holding a concert that’s opened by Dolly Parton and headlined by Kanye West. – Want to serenade your babe with Seal’s “Kiss from a Rose”? You only need to drum up $250,000-$350,000. Check out a few of the brackets below, and then head here for all 14 brackets.